With Dynatrace, it&apos;s easy to monitor your entire environment. OneAgent provides monitoring support for all major operating systems and frameworks. But what if you&apos;re using a technology that can&apos;t be monitored with OneAgent? Use ActiveGate plugins! What can I achieve with ActiveGate plugins? 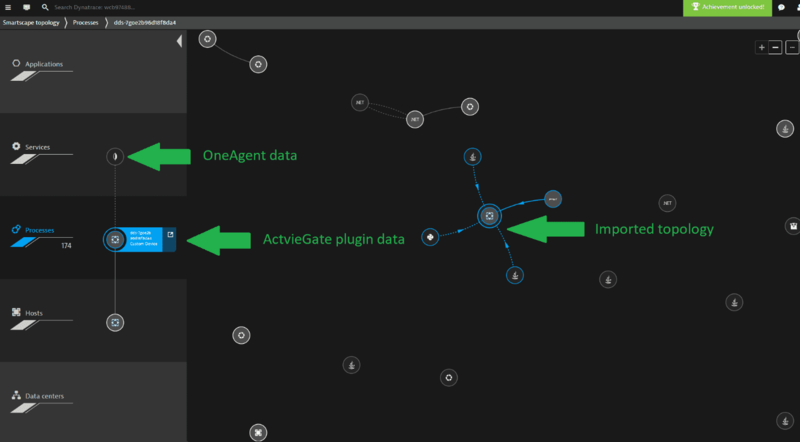 With ActiveGate Plugins, you can integrate Dynatrace monitoring with any remote technology that exposes an interface. You don’t need to install OneAgent. ActiveGate plugins run in ActiveGate and gather data remotely. With deep integration, Dynatrace can import not only other technologies’ metrics, properties, and events, but also their topologies, which can be subsequently analyzed with the Dynatrace AI! Along with this ability to monitor new technologies comes one of the main benefits of Dynatrace: causation between user actions, technology-specific data, transactional visibility, and more. Feed Dynatrace with metrics, events, properties, and a topology from any technology that exposes an interface. Have Dynatrace AI analyze the incoming data in exactly the same way it analyzes out-of-the-box supported technologies. How does Dynatrace utilize the data acquired through ActiveGate plugin monitoring? OneAgent monitors the Java application. A Dynatrace ActiveGate plugin for Alibaba monitors the Alibaba MongoDB cloud. Data from an Alibaba MongoDB node is mapped to a custom device entity in Dynatrace. Cluster data is bound to an entity that represents the cluster. Dynatrace connects data discovered via OneAgent with data from plugins. This means you have transactional visibility into requests that come from the application monitored via OneAgent to the technology monitored by the ActiveGate plugin. The AI works the same way it does for all out-of-the-box supported technologies. What is the ActiveGate plugins architecture? ActiveGate plugins are executed on an Environment ActiveGate. ActiveGate plugins connect remotely to a monitored technology and execute once each minute. You need to deploy ActiveGate plugins on an ActiveGate and upload them to the Dynatrace server. Dynatrace doesn’t automatically redistribute the plugins between Dynatrace server and ActiveGates. ActiveGate plugins consist of two main Python and JSON files. With JSON, you define how the data is presented in the Dynatrace web UI. With Python, you can define additional events and create custom properties. For more information, see the ActiveGate plugins reference. ActiveGate plugins use paid custom metrics. You get 10 free custom metrics per each OneAgent instance, plus 100. To buy more custom metrics, contact your Dynatrace sales representative. How do I get started with ActiveGate plugins? Learn what you can achieve with ActiveGate plugins and define your monitoring needs. See ActiveGate plugins capabilities. Deploy your first ActiveGate plugin. This will give you an overall idea of the whole framework. See ActiveGate plugins hands-on. Read through the topics that present real-life examples of building custom plugins. See ActiveGate plugins how-to. Get to know the ActiveGate plugins reference. You&apos;ll use it extensively in your plugin development.